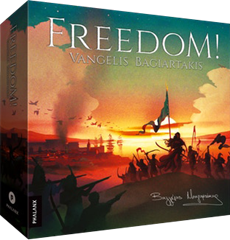 It's a siege game, a test of will, endurance and tactics between the besieged freedom fighters and the besieging imperial forces, who have come to crush the rebellion. This universal contest is presented through a dramatic history of the siege of a Greek Holy City (Messolonghi) by Ottoman forces during the Greek War of Independence. Note that this highly asymmetrical game is available on Kickstarter right now!